The NEW Universal Cutting Mill from FRITSCH is ideal for size-reduction for a wide range of different materials due to variable adjustment of the rotational speed of the rotor, various knife geometries, replaceable blades, practical sieve cassettes and that with an unmatched ease of cleaning. 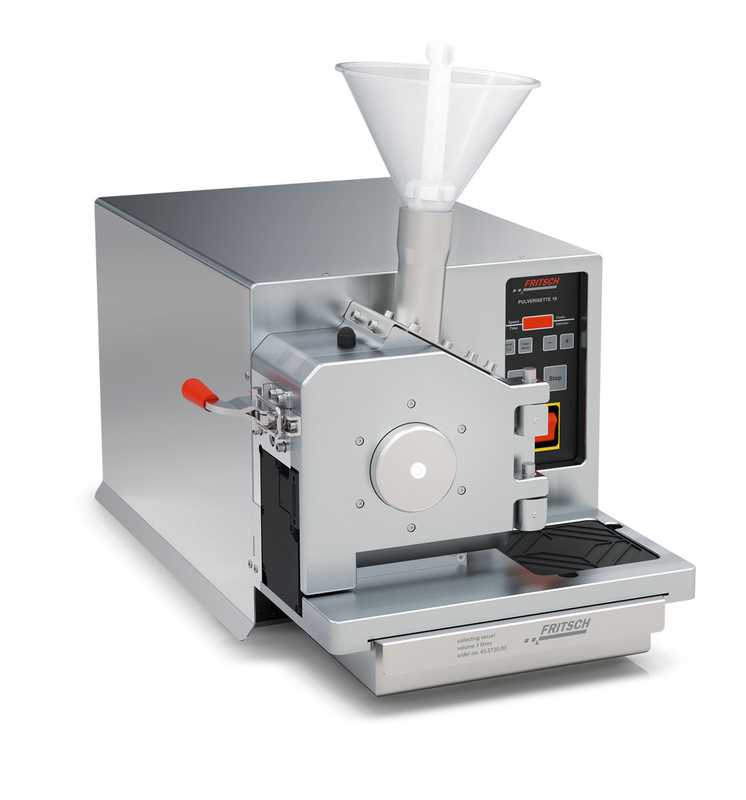 The high-speed Universal Cutting Mill PULVERISETTE 19 with variable rotational speed adjustment between 300-3000 rpm grinds with a maximum feed size of 70 x 80 mm and a throughput quantity of up to 60 l/h fast and effectively dry, soft to medium-hard sample materials as well as fibrous materials and plastics with reliable reproducible results. One special advantage: Straw, films and similar materials can be fed in their full length without additional preparation. And the PULVERISETTE 19 is also ideal for RoHS tests. The low-speed Universal Cutting Mill PULVERISETTE 19 with variable rotational speed adjustment between 50-700 rpm offers due to the combination of extremely low cutting rate and extreme cutting forces a very powerful comminution of hard, tough-elastic samples or of small sample amounts – and is the ideal solution for all cases where for example thermal damage, the loss of easily volatile substances or a larger fine share is to be avoided. The Universal Cutting Mill PULVERISETTE 19 is also available in both variable rotational speed versions in a corrosion-resistant stainless steel 316L version. It is FDA compliant and has an increased resistance to corrosive media such as alkalis and acids, but especially to chloride containing media. This entry was posted in Uncategorized and tagged Fritsch, PULVERISETTE 19, Universal Cutting Mill.